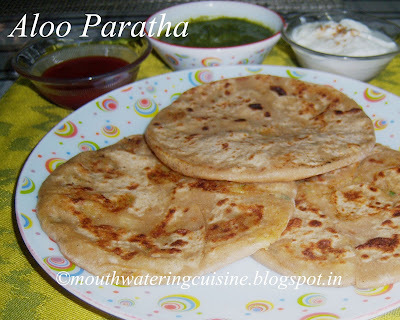 Aloo Paratha is one of the most popular breakfast dish of Northern and Western parts of India. Flatten whole wheat bread stuffed with spicy potato mash. It is usually served with curd, sugar, butter and chutney. I am a South Indians like everything spicy, so served it with green chutney. Long back, when we (my husband and me) were travelling to Agra from Delhi in a car, our car driver stopped at a typical Dhaba in a village called Kursi. There he serves only Punjabi cuisine. That was where I had authentic taste of aloo paratha. One will fall in love with its taste. The cook of the dhaba is so generous with us, he showed how they make it and also gave me the recipe. They cook it on clay stove called chulha, and back home, gave a try, of course had to cook on stove top only. But the taste was nice and was almost the same. And most important thing is it is liked by every one of my family members. Even now I follow the same recipe. Whenever I make aloo paratha I want to post it, but could not do it for some silly reasons. Now time has come to post it, so here it is. In a wide bowl take wheat flour, salt and add water. Make a smooth dough by adding little by little water. Cover it and allow it rest for half an hour. The dough should be like that of sukha roti or phulka. Peel the skin and wash potatoes. Chop green chillies, ginger and coriander leaves. Pressure cook them for three or four whistles. Allow this to cool. Once potatoes cooled, mash it with masher. Mix well. Add salt, red chilli powder, aam chur powder, cumin seeds powder and garam masala to it. Mix it with hands to get proper potato mash without any lumps. Make equal size roundels of potato mash and dough. Roll one dough roundel into 4" diameter. Put one roundel of potato mash. Bring the edges together and seal it, Remove the excess dough and flatten it gently with the help of hands and roll it using rolling pin. Heat roti tawa, place one roti on it. Cook till brown spots appear on one side. Flip it and cook the other side. Slowly press it with the help of spatula. Add one spoon of oil or ghee and cook on both sides. 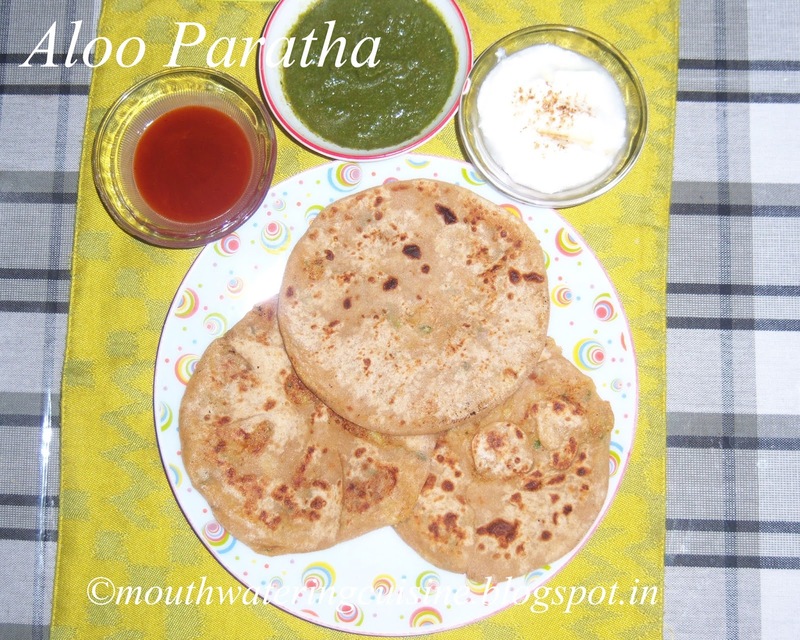 Serve hot aloo paratha with green chutney, tomato sauce and curd sprinkled with cumin powder.